Created with the calligrapher, graphic artist and illustrator in mind, this set includes 10 High Flow colors typically used for illustration and invitations. The High Flow pamphlet included in the set provides an introduction to the line and a color chart of all the colors available. 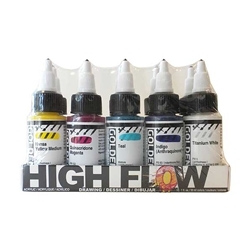 Colors included in this set include iridescent gold (fine), iridescent copper (fine), iridescent silver (fine), carbon black, titanium white, neutral gray N5, teal, hansa yellow medium, quinacridone magenta and indigo (anthraquinone).